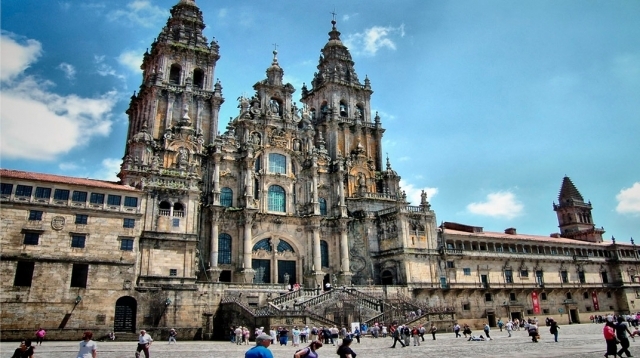 This Thursday June 22, the Camino de Santiago has already overcome the barrier of 100,000 pilgrims who have completed their journey in the cathedral of Santiago de Compostela. This totally symbolic figure was reached 8 days earlier than in 2016, when on June 30 a Murcian father and his son arrived at the cathedral after having traveled the Portuguese Way for 10 days. On this occasion, two Brazilian pilgrims, Juliana Pivato and Eliezer Ribeiro Antunes Junior, traveled the entire French Way from Saint-Jean-Pied-de-Port. After arriving at the cathedral, both received their compostela and were received at the mass of the pilgrim this Thursday by the dean of the temple, Segundo Pérez, and the manager of Xacobeo, Rafael Sánchez. The Camino de Santiago 2017 is on the verge of reaching its equator while the figures managed by the Pilgrim's Office point to an increase of influx of 12% over the same period last year. If the flow of pilgrims remains constant, everything suggests that 2017 could happen to 2016 (278,041 visitors) as a historical year of more pilgrims (since this figure is accounted for in the early 1990s).